Fiemmeite: Mineral information, data and localities. Yet another Cu-bearing oxalate mineral (compare moolooite, middlebackite, wheatleyite, and antipinite). Found at the type locality in coalified woods in Upper Permian Sandstone permeated by mineralizing solutions containing Cu, U, As, Pb and Zn. The oxalate anions have originated from diagenesis of the plant remains included in sandstones. Aggregates up to 1 mm across made of sky blue elongated platelets with maximum dimensions about 50 μm. Demartin, F.; Campostrini, I.; Ferretti, P.; Rocchetti, I. 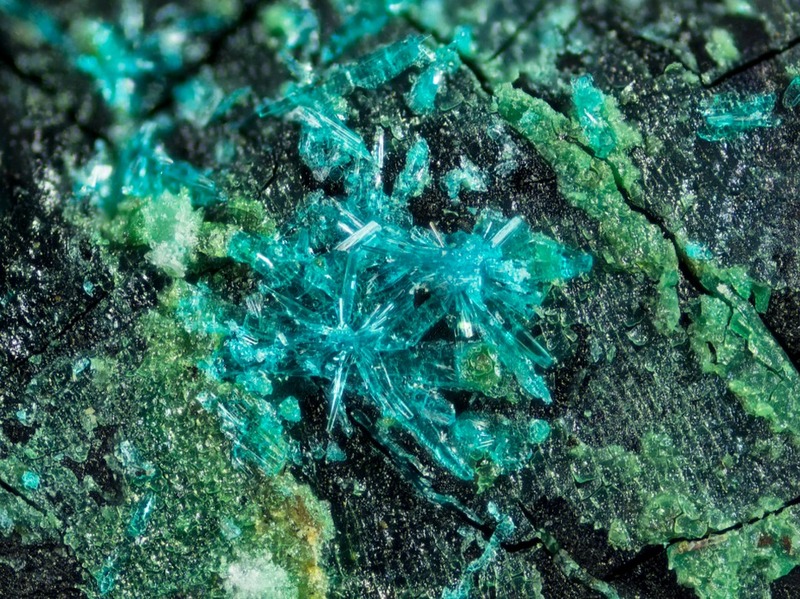 (2018) Fiemmeite Cu2(C2O4)(OH)2∙2H2O, a New Mineral from Val di Fiemme, Trentino, Italy. Minerals 2018: 8: 248. Demartin, F.; Campostrini, I.; Ferretti, P.; Rocchetti, I. (2018) Fiemmeite Cu2(C2O4)(OH)2∙2H2O, a New Mineral from Val di Fiemme, Trentino, Italy. Minerals 2018: 8: 248.